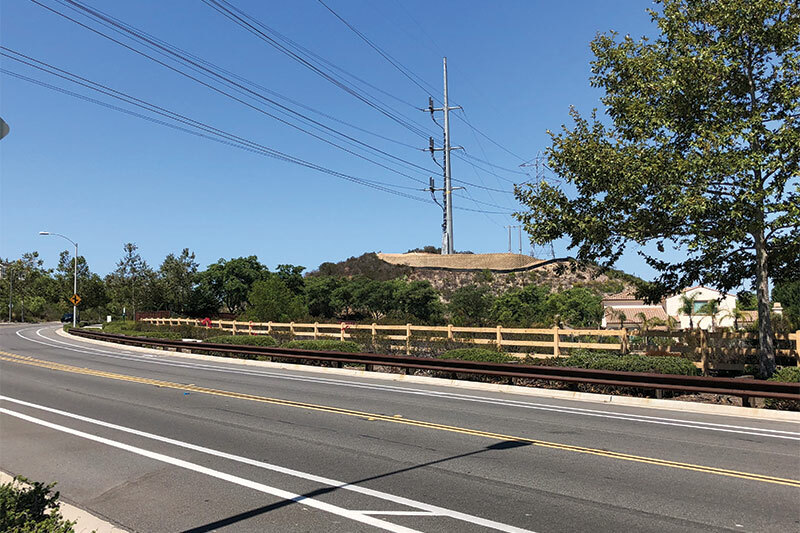 San Diego Gas & Electric (SDG&E) is nearing completion of its Sycamore to Peñasquitos 230 kilovolt (kV) Transmission Line Project through Scripps Ranch and is finalizing repairs to the roads affected by the underground work. Left in the project’s permanent wake, however, is a 160-foot-tall, 230 kV transition pole that towers above Stonebridge Parkway and neighboring homes. When the pole was first installed last fall, local residents immediately voiced their concerns, referring to it as “an eyesore,” and felt they had been misled by the original project description. Early project renderings depicted a pole that would be similar in height to neighboring transmission lines, whereas the final structure is significantly taller. Residents also reported being dismayed by the installation given their understanding that the new transmission line would be installed underground. Following preparation and review of an environmental impact report (EIR) for the project, 41 alternatives were identified, several of which were dismissed due to infeasibility based on environmental, legal or other considerations. The California Public Utilities Commission (CPUC) narrowed the alternatives down to five for full analysis. “Ultimately, the CPUC approved Alternative 5 (Pomerado Road to Miramar Area North Combination Underground/Overhead) as the environmentally superior alternative, in part because it would minimize significant and unavoidable impacts to Aesthetics, Noise and Recreation. Significant and unavoidable impacts to visual quality would be limited to one cable pole,” read the email from Torres. With the project approved and no immediate recourse to halt its progress, residents formed a committee in November 2017 to negotiate funding from SDG&E to soften the appearance of the imposing structure by adding trees and other aesthetic enhancements along Stonebridge Parkway. Stonebridge resident Monica Emanuele organized the group, which dubbed itself the “beautification committee.” They held several meetings with SDG&E and homeowner’s association (HOA) representatives, and consulted with arborists and landscape architects to determine the most ideal, yet cost-effective, design to minimize the visual impact of the towering structure along the parkway. Emanuele said that the committee also created a mission statement, formalizing itself with an identified purpose which it presented to the HOA early in the process to secure support and recognition as a grassroots committee of Stonebridge homeowners. Over the course of several more meetings, Emanuele said the committee was successful in negotiating incrementally more funds toward the beautification project, ultimately securing $70,000 from SDG&E. At the April 2018 HOA board meeting, the beautification committee submitted a written plan with its formal recommendation for utilization of the $70,000 from SDG&E, which was required in order for the board to vote to accept the funds from the utility company. The plan included proposed types, quantities and placement of trees along Stonebridge Parkway, together with corresponding justification based on its months of research, and in alignment with the original mission that had been adopted when the committee was first formed. A representative from Stonebridge HOA indicated that installation of trees is expected this fall.